The breadth of the claims in the application should always be carefully noted; that is, the examiner should be fully aware of what the claims do not call for, as well as what they do require. During patent examination and reexamination, the claims are given the broadest reasonable interpretation consistent with the specification. See In re Morris, 127 F.3d 1048, 44 USPQ2d 1023 (Fed. Cir. 1997) and In re NTP Inc., 654 F3d 1279, 99 USPQ 1481 (Fed. Cir. 2011). See MPEP § 2111 - § 2116.01 for case law pertinent to claim analysis. Frequently, a claim includes within its breadth or scope one or more variant embodiments that are not disclosed in the application, but which would anticipate the claimed invention if found in a reference. The claim must be so analyzed and any such variant encountered during the search should be recognized. For any claim capable of such treatment (e.g., a machine or other apparatus), the subject matter as defined by the claim may be sketched or diagrammed in order to clearly delineate the limitations of the claim. Two or more sketches, each of which is as divergent from the disclosure as is permitted by the claim, will assist the examiner in determining the claim’s actual breadth or scope. However, an applicant will not be required to submit such sketches of claim structure. In re Application filed November 16, 1945, 89 USPQ 280, 1951 C.D. 1, 646 O.G. 5 (Comm’r Pat. 1951). All subject matter that is the equivalent of the subject matter as defined in the claim, even though different from the definition in the claim, must be considered unless expressly excluded by the claimed subject matter. See MPEP § 2181 - § 2184 for a discussion of equivalents when a claim employs means or step plus function terminology. The Internet is an Office-approved search tool that may be considered when planning and conducting a search for an application. The Internet provides the Office the opportunity to enhance operations by enabling patent examiners to efficiently locate and retrieve additional sources of information relating to a patent application. 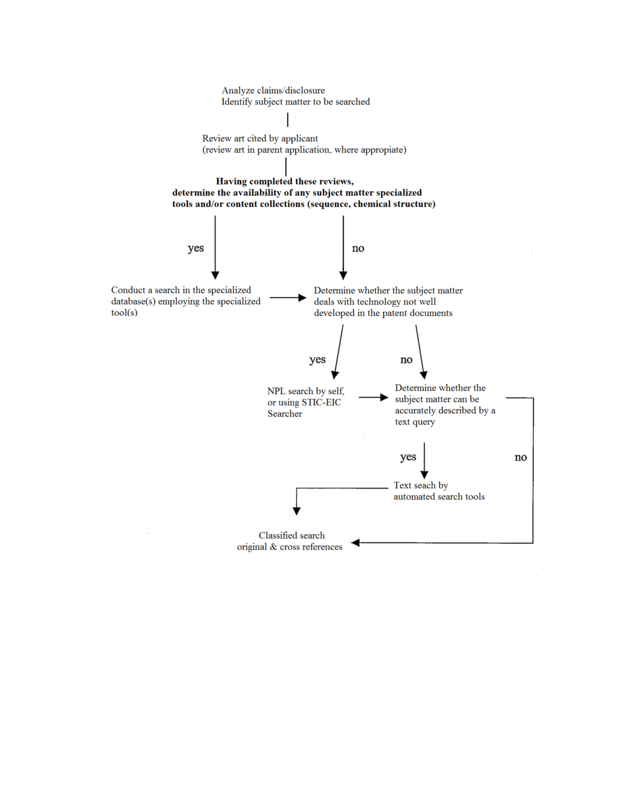 The Office published a Patent Internet Usage Policy to establish a policy for use of the Internet by the patent examining corps and other organizations within the USPTO. See Internet Usage Policy, 64 F.R. 33056 (June 21, 1999). Articles 9 and 10 of the Patent Internet Usage Policy, which are pertinent to Internet searching and documenting search strategies, are reproduced below. Article 9 primarily addresses using the Internet for unpublished application searches. As mentioned therein, it is necessary that Internet searches related to unpublished applications MUST be limited to the general state of the art and formulated in such a way that protects the confidential proprietary intellectual property. USPTO personnel may also use the Internet to search, browse, or retrieve information relating to the claimed invention(s) of a published application or proceeding including an application published pursuant to 35 U.S.C. 122(b), a reissue application, or a reexamination proceeding. These applications need not be kept in confidence; therefore, the restriction on the search queries used when performing an Internet search referenced in Article 9 below would not apply to these applications and proceedings. Any search query may include terminology related to the general state of the relevant technology, disclosed features from applicant’s disclosure and claim terminology. See MPEP § 707.05(e) for information pertaining to the citation of electronic documents, MPEP § 719.05, subsection II for documenting an Internet search, and MPEP § 502.03 for information pertaining to communications via electronic mail. The Internet is generally a public forum and most communications made over the Internet are neither confidential nor secure. All use of the Internet by examiners must be conducted in a manner that ensures compliance with confidentiality requirements in the statutes, including 35 U.S.C. § 122, and regulations. Additionally, any Internet searching that is conducted is to be limited to searching for the information necessary for examination of the application or proceeding, such as the state of the art or the presence or absence of technical features in the prior art. All Patent Organization users of the Internet for patent application searches must document their search strategies in accordance with established practices and procedures as set forth in MPEP § 719.05 II. In doing a complete search, the examiner should find and cite references that, while not needed for rejecting the claims, would be useful for forestalling the presentation of claims to other disclosed subject matter regarded by applicant as his or her invention, by showing that this other subject matter is old or obvious. In selecting the references to be used in rejecting the claims, the examiner should carefully compare the references with one another and with the applicant’s disclosure to avoid an unnecessary number of rejections over similar references. The examiner is not called upon to cite all references that may be available, but only the “best.” (See 37 CFR 1.104(c).) Multiplying references, any one of which is as good as, but no better than, the others, adds to the burden and cost of prosecution and should therefore be avoided. The examiner must fully consider all the prior art references cited in the application, including those cited by the applicant in a properly submitted Information Disclosure Statement. The best reference should always be the one used in rejecting the claims. Sometimes the best reference will have a publication date less than a year prior to the application filing date, hence it will be open to being overcome under 37 CFR 1.130 or 1.131. In such circumstances, if a second reference exists which cannot be so overcome and which, though inferior, is an adequate basis for rejection, the claims should be additionally rejected thereon. In all references considered, including NPL, foreign patents, and domestic patents, the examiner should study the specification or description sufficiently to determine the full value of the reference disclosure relative to the claimed or claimable subject matter.